A field research team led by Profs. Rachel Lauer and Larry Bentley investigated groundwater aquifer structures on October 22 along a stretch of Range Road 25 at the west end of Sylvan Lake. 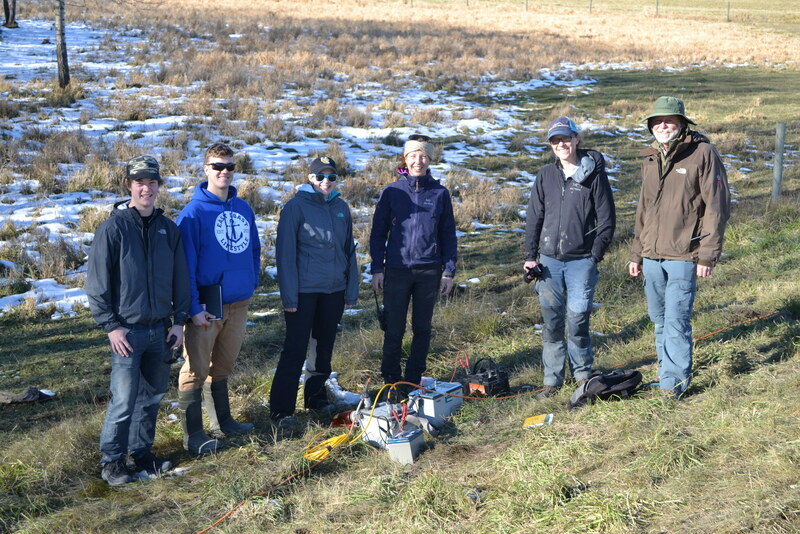 The field team of geophysics students (L to R) Daniel Kent-O’Donnell, Malcolm MacDougall, Rachel Deschenes and Jen Hanlon with Profs Lauer and Bentley. The project is an extension of the Alberta Energy Regulator’s major Sylvan Lake Groundwater Project that has collected geological data using airborne instrumentation to map the subsurface of a large area of Central Alberta including our local sub-watershed. The new data from the field work will help to interpret the results of that research. 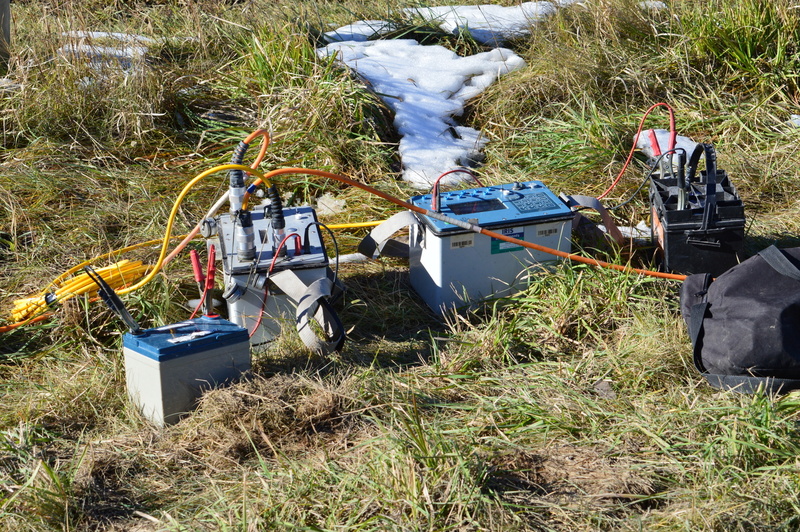 The team used a junction box, controller, data logger and power supply to collect earth resistance data. The ERT cable connected the 10-inch steel electrodes to the control console and computer that applied the currents between electrode pairs used in the survey and measured the response of the ground to those electrical pulses. 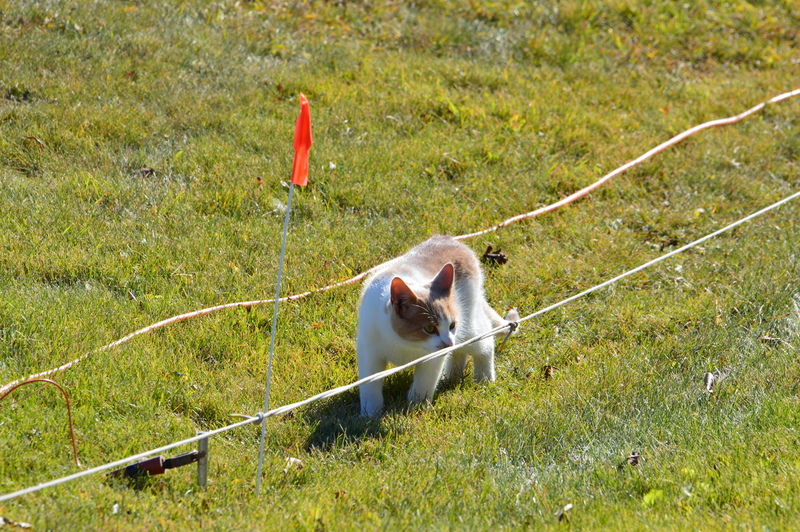 A curious neighborhood cat inspected the ERT cables at an electrode station. ERT does not have any impact on the environment. After the data are further processed back at the U of Calgary the images of the subsurface will help the team to ground-truth the previously collected airborne geophysical data, make progress toward understanding the structure of the Paskapoo Formation in this area, and improve our understanding of the local aquifer hydrogeology. 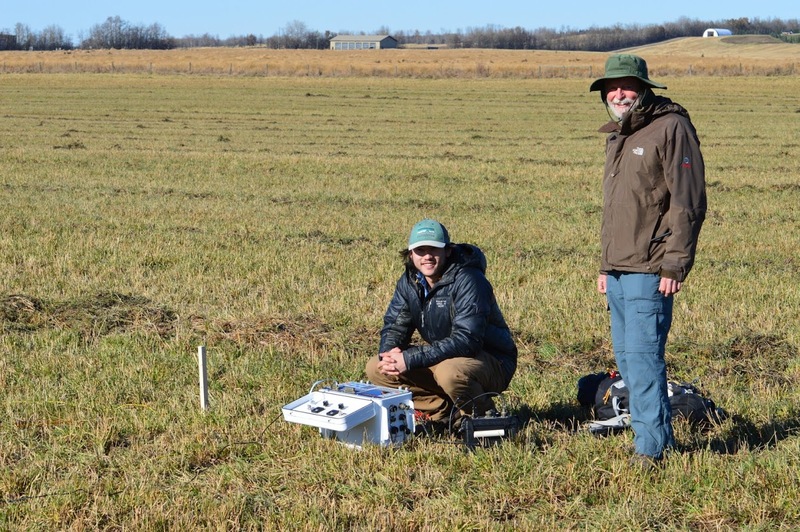 At a separate site, senior geophysics student Michael Law used a different Electro-Magnetic exploration method that transmitted a magnetic field into the ground and detected the response using two coils laid out on the pastureland. Geophysics student Michael Law and Prof. Bentley prepare to explore 100 m below the surface. Results from both geophysics surveys will be added to the Sylvan Lake Groundwater Project database to improve the knowledge of the Paskapoo formation’s structure and properties surrounding Sylvan Lake. Although watershed residents rely on groundwater for domestic use, more geological research is still needed to understand the quality, quantity and the hydrogeology dynamics of the aquifers that store and supply that water. The Range Road 25 study was located at the western edge of the Sylvan Lake watershed basin. Landowners in the project area supported the work and allowed access to their land by the U of C team. Lacombe County permitted use of the roadside ditch for ERT line installation.